You are invited to hit the Red Carpet, sip and schmooze, and mingle with the Who's Who of Bellingham at Pickford Film Center’s 10th annual Academy Awards viewing party - The Red Carpet Affair. This swanky benefit event sponsors PFC’s Education Fund, which provides innovative Media Literacy courses and Doc-ED documentary screenings, free to local middle school students. The evening begins with your walk on the red carpet captured by professional photographers, butlered appetizers and hearty gourmet appetizers crafted by Crave Catering, drinks, dessert, and intermesso fun interspersed throughout the evening. 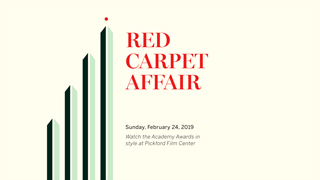 The live broadcast of the 91st Academy Awards from the Dolby Theatre in Los Angeles will screen live from Pickford Film Center's lobby which has transformed into a most glamorous garden party soiree.